Back in Part 1 I wrote about the history and reasons I’ve been re-inspired to start running again. I always thought running “sucked” and have seen people pounding concrete and would just cringe. I’ve decided to start from zero and this is my story. I’ve run/walked now 3 times and can say that as long as I am maintaining my good form, I feel great. I’ve been racing cyclocross this fall, and still get winded after about 30 seconds of running at which point I can tell my form is degrading, so I stop and continue walking. Each day after running I’ve felt my calves and quads were sore and tight, in a good way. Today, three days since my last run, my calves are just starting to not feel so sore and tight. After each run and in the evenings I’ve been sitting on my rumble roller and using an inflatable ball to help my tight muscles let go and release. Feels great! I plan to start the Couch To 5 K training plan next week using the free app, as a way to keep a steady training regimen without going too hard, but I’m not married to it and may just continue to run when it feels right. What I do know about myself is that if I am left to make my own training plan, I usually don’t ride (or workout) as hard or as far, and I’m assuming this will also be the case with running. 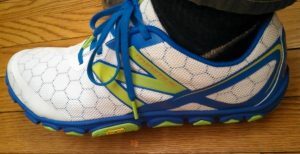 I’m currently running in a pair of my brothers used New Balance MT101’s and they are about a 1/2 size too small for me, but are still comfortable and work for now considering I’m not running very far. Unfortunately the local running stores do not carry this shoe. I tried on a few pairs of Merrells and a Brooks minimalis shoe, but the Merrells hurt and the Brooks didn’t have the feel of the ground I was looking for. I did find the New Balance MT10v2 at REI, but the 12 is too small and the 13 is huge, so I’m waiting on a few pairs in size 12.5 and 1 in size 13 (that was on sale) to arrive in the mail. The first pair arrived yesterday, see pic below. I plan to return the ones I don’t like or that do not fit, but considering this is still much less expensive that a new bicycle or even bike parts, I might keep them. 😉 I plan to do a mini write up as the 3 I’ve ordered are all different variations and I’ll compare the fit and feel of each. Last summer, my wife, Andra, started trail running for exercise and really enjoyed it, but stopped for some reason, probably her knees were hurting. About a month ago she decided to sign up for and run a 5k this spring. I actually encouraged her to start running again. After her 1st 2 runs of the Couch to 5K running plan, her knees were swollen and painful. It took her about a week or 2 to recover. I bought her a pair of Merrell Road Glove Dash 2’s last week from REI and convinced her to try running again. These are a zero drop, light weight running shoe with a Vibram outsole. She’s now run in them twice, wore them all weekend and stated that “they are the most comfortable shoes I have.” As a side effect, since running in these shoes on trails she has not presented with or mentioned any knee pain or swelling as she did when she ran before in her more traditional shoes. So now that that is out of the way, check out this awesome video that breaks down the midfoot strike form into 4 points. And this one, by Mark Cucuzzella, M.D. at the Natural Running Center goes into more detail about form, running economy, movement and biomechanics while still being easy to understand and beautiful to watch. Have you made a change in your running form from a heel strike to midfoot strike? Have you transitioned from traditional running shoes to minimalist shoes? What was this experience like for you? Please let everyone know your experience in the comments section below. Dr. Aaron LeBauer is a Doctor of Physical Therapy and Licensed Massage and Bodywork Therapist. He owns LeBauer Physical Therapy, LLC, with his wife Andra, in Greensboro, N.C. He has been helping active people stay fit, active and healthy without medications, injections or surgery since 1999. He earned his Doctor of Physical Therapy degree from Elon University in 2008. Dr. LeBauer graduated from Duke University in 1996 with a B.A. in History and moved to San Francisco where he studied Massage Therapy and Health Education at the National Holistic Institute. He has specialized in Myofascial Release since 2000 and is an Instructor with the John F. Barnes MFR Seminars. A native of Greensboro, Dr. LeBauer returned in 2005 to continue the third generation of LeBauers as health care professionals in Greensboro. Dr. LeBauer helps weekend warriors, high level athletes, desk jockeys, students, children and anyone with pain, stiffness return to the activities the love without expensive imaging, pain medications, injections or surgery. 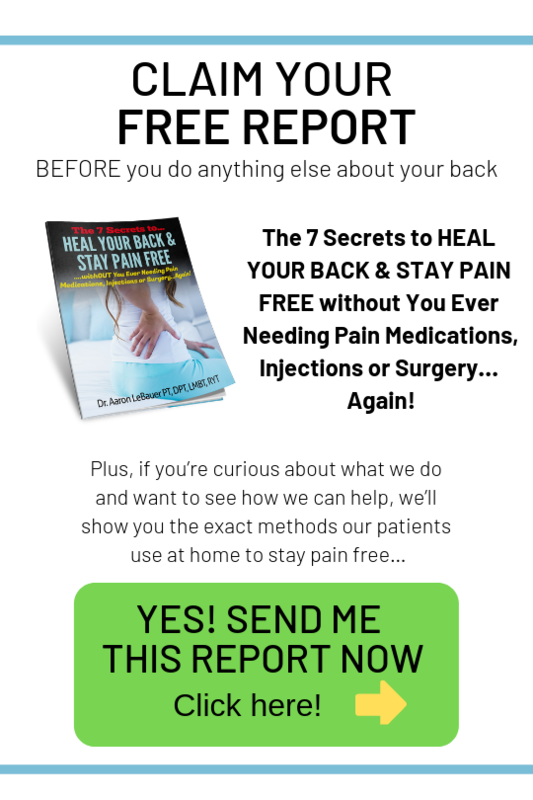 He specializes in treating people with chronic conditions, pain and injuries which have not responded to traditional treatments and therapies with the goal of helping patients have less pain, move better and feel wonderful in their bodies. Dr. LeBauer also helps other physical therapists start and grow successful cash-based physical therapy practices. He has developed an online training course that describes in detail how to start a small private practice, along with his marketing secrets and strategy. He is currently available for recorded telephone and video coaching sessions, email support, on-site visits and speaking engagements. Contact him for more information, rates and services.. Dr. LeBauer enjoys riding one of his vintage Vespa and Lambretta scooters or his bicycle to work. He has raced bicycles since high school and as a category 1 amateur throughout the United States. He was based out of Northern California and North Carolina and spent a very memorable summer racing in Belgium, France and the Netherlands. He enjoys working in his garden and has an edible landscape including pears, apples, scuppernogs (native muscadine grapes), raspberries, blueberries, figs, various seasonal vegetables and shiitake mushrooms. He has two beautiful daughters and an amazing wife. I had been running treadmill 5ks in regular sneakers with a heal strike for some time. I switched up to the Merrell Barefoots about a year ago and also moved to a midfoot strike. The switch made my calves ache the first week and again when I ran outside the first time, but it didn’t take too long to adjust. I haven’t checked out the other videos to see if the rest of my form is bad or not. The funny thing is that now I’m aware of the midfoot strike I also tend to do it more while just walking, especially when wearing thin shoes/sandles. Nothing hurts aside from calf muscles when I’m out of shape. I’m a believer. Thanks for your comment and sharing your experience.